It’s a valid truth, that there is a huge community of individuals and companies at present, processing and launching metro WordPress themes, which offer many high-quality and functionally saturated designs. The theme, being a skin of the WordPress content of any kind, is what makes your website have a stunning and uber look and feel, as well as function well. In the diversity of today’s metro WordPress themes, introduced to us, style and metro WordPress themes deserve special attention. They are based on the metro design language, created by Microsoft, the basic design principle of which is better focus on the content of application. 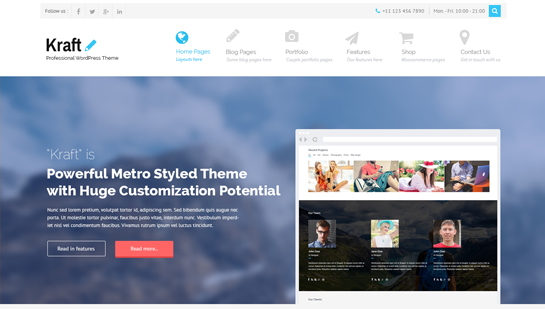 Each of these metro WordPress themes has an inexhaustible supply of powerful theme tools, settings and options, which will help you customize and have a complete control of your personal, corporate, business, commercial or any other website with ease. Each of them being equipped with modern and animated interface and all-inclusive package of applicable theme options and features. Choose any of them and you will have a reliable and firm foundation, on which a modern, flexible and accessible website can be built and developed. First of the metro WordPress themes in our list, which is able to provide a superb look and experience, is Complete Pro. This metro style layout lays stress both on outstanding and eye-catching interface design, as well as complete functionality, which is more than enough for you to run a successful website. Complete Pro is a responsive and full color changing theme with default slider with animation, pause control and other features, convenient homepage sections and areas to highlight the relevant content, widgetized footer, header and sidebar, ready to use shortcodes and compatibility with major plugins. SKT Charity Pro is another dependable layout built on a metro style platform and hence listed in the metro WordPress themes category, which can be best used to cover any non-profit, volunteer, charity or religious activities. This user friendly and modernly and conveniently designed theme is loaded with controllable default slider with manifold effects, more than 580 icons, more than 650 Google fonts and more than 8 page templates, standard pages and overall easy to manage and use theme sections and options.SKT Charity Pro is also accessible and applicable on all major devices and is optimized for being used with qTranslate X, Nextgen Gallery, WooCommerce, Contact Form 7, WordPress latest version, donation and other plugins. Towing is based on the similar style and hence falls into metro WordPress themes, acting as a great support to you and giving your website a smart and superb look and feel. This theme can be used to cover a wide range of topics, referring to any kind of towering industry, activity or undertaking. The theme comes with lively slider to showcase the most appropriate images and content, home, about us, services, gallery, blog and other sections and areas to display all the required information, images, services, other data, etc., more than 580 icons availability and compatibility with lots of popular plugins. Contact form with captcha to help protect spam and contact details. SKT Construction Pro is another all-inclusive, professionally looking and adaptable theme with metro style shades and hence falls into metro WordPress themes category, which spares no effort to be a perfect solution for any kind of website, particularly for construction, building, renovation, architecture, modeling, design agency or company presentation. This Google mobile friendly theme functions well with major devices, is packed with applicable homepage sections and areas, controllable default slider with up to 10 slides and 12 options availability, diverse icons pack and Google fonts integration and other easy to use theme options and features. Toothy is another suitable and high-quality layout with metro elements and hence is another one of the metro WordPress themes. This professional, highly integrated and super packed theme is a convenient platform, praised for its full responsiveness and conformity to all major devices and mobiles, which can be successfully applied to create and promote dentist, medical, health or other related websites. All the theme elements, including theme colors, text, images and background can be easily changed, lots of icons, shortcodes and Google fonts are integrated among the theme. Toothy also shows great functionality with diverse plugins. One more dynamic, flexible and user friendly and one of the metro WordPress themes with metro style characteristics and outstanding interface is Gravida. This serious and functionally pervaded theme is presented with ready full screen responsive slider with diverse applicable controls, 2 home version availability, animated homepage sections and boxes to use accordingly, coding with HTML5 & CSS3 and compatibility with SEO, SMO and WordPress latest version standards. We Bake is animated, beautifully crafted and adaptable metro WordPress theme, which can be your helping hand in the business of successful and competitive bakery or other website creation and management. This responsive and easy to use and manage theme is powered by default homepage slider with slider elements and settings, including pause time, animation effects, slider speed, etc, widgetized footer and header areas, different shortcodes, social media and Google fonts integration and many other incredible theme options and features. Blendit is smart and elegant one page responsive theme, based on style principles and hence falls under metro WordPress themes. It seems to be a perfect tool for creating any type of website with uber look and feel, be it a personal, corporate, profit, non-profit, creative or any other activity or performance. Blendit nicely designed theme is packed with default slider with controllable elements and features, more than 600 Google fonts, as well as social media integration and WooCommerce, Contact Form 7 and SEO friendly coding. Kraft is adaptable, multi-use and all-inclusive layout with appealing design and metro look. This dependable, smart and solid one of the metro WordPress themes with plenty of features comes with default homepage slider with diverse manageable features, fitting homepage sections, areas and columns, theme complete documentation, 500+ font icons, 100+ shortcodes and 600+ Google fonts, social media icons, conforms to HTML5 & CSS3 coding standards and provides perfect responsiveness while running on different mobiles and devices. This entry was posted in wordpress themes and tagged Uber look WordPress themes on February 14, 2019 by SKT Posts Themes.